This great 4 pack is just what baby needs in it's first year. The Learning Patterns developmental system of toys is designed to help bring out your baby's full potential by awakening and rewarding developing abilities throughout the first year. The Flip Flop Caterpillar stimulates baby's sense of sight with its light-up nose, bright colors, bold patterns, and a special smile in the mirror. The Jungle Pal Music Mirror is designed to spark developing senses with delightful music and stimulating sights - like baby's own reflection. With its motorized color wheel, the Changing Sensations Mobile offers an intriguing display of gradually changing, high-contrast colors and patterns for baby to gaze at. 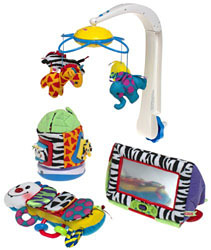 The Learning Patterns Jungle Sounds Sorter offers baby plenty of jungle fun along with developmental benefits. Three cute shape sorting characters (lion, fish, zebra), bold colors and patterns, entertaining jungle music and lights add to the developmental fun.